Granite is well-known for being a very dense, hard, and durable rock. Its this durability plus its natural aesthetics that makes it popular in homes and offices. It’s also pricey, ranging from $15 to $40 per square foot. Professional installation adds to the cost with $25-$35 per square foot. So to cut down on expenses, many homeowners have considered cutting the granite by themselves. Fortunately, you don’t need to be a stonemason to do the job, as long as you proceed with precautions and use specialized granite cutting tools. In order to properly cut through granite, you are going to need the right type of blade. Granite is a very tough type of material, and you won’t be able to make a dent in it with normal blades. 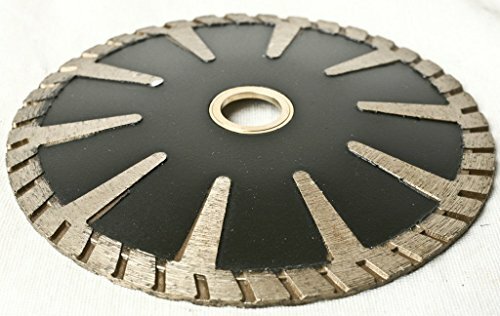 You need to have diamond blades in order to cut granite properly. One of the most typical types of diamond blades that are used to cut granite is the diamond masonry blade. This blade can be attached to many different types of saws. It will be capable of making precise cuts to granite. The blade being shown here features fourteen teeth that are segmented. This is a great blade for general masonry work, and you will want to own it if you are going to be cutting granite for your project. These saw blades should last for a while, but you should expect to have to change blades at some point in time. Buying several of these diamond masonry blades when you have a big job coming up is sensible. This blade here is actually very cost-effective, so it shouldn’t be difficult to buy the proper number of blades that you need. Attaching this blade to your saw shouldn’t be difficult to accomplish either. This type of blade can be used to make either wet cuts or dry cuts. No matter what your general masonry needs are, this saw blade will be useful to you. You should always be able to buy diamond masonry blades like this at major hardware stores. Buy the right blade to fit your saw today so that you can get to work. Diamond contour blades are another important blade type that you will want to become familiar with. If you are going to be working with granite, then you need to know the right blades to use for different situations. A diamond contour blade is going to be what you want to use when you need to cut curves into granite. Curved cutting is going to be possible with this blade, so you’ll definitely want to purchase it for complex granite cutting jobs. People use these types of blades when they are installing granite countertops or sinks. Granite is a very common and popular material in bathrooms and kitchens. If you are going to be doing work installing and creating these types of things, then you need the right blades to rely on. A diamond contour blade will certainly make the job a lot more manageable. This is another blade type that should fit on many different saws. You should be able to cut a perfect circle with this blade if you need to do so. It will be very accurate and can give you the results that you want. This is a very sharp blade that will be able to make cutting granite easy. So many people use tile saws to cut things for large projects. They are a convenient tool to own that can make many jobs a lot simpler. You can use your tile saw to cut granite for your project so long as you have the right blade. A diamond circular saw blade is going to be capable of making the cuts that you need, so it’s a worthwhile purchase. This blade will actually be really useful for cutting lots of different materials. You will be able to effectively cut through ceramic, porcelain, and even marble. Your granite jobs will always be a lot easier when you have this blade, and you will be able to rely on it for a long time. It is built to be a durable blade, so you won’t have to change the blade out as often as you would some of the others. You are meant to use this blade on a tile saw that is being used for wet cuts. It isn’t recommended for dry cutting. Keep this in mind, and make the purchase that you need to based on your needs. You should be able to find a blade for a tile saw that is meant for dry cutting, so know that the option is out there. You will want to own a diamond profile wheel when you need to shape granite. When you’re installing granite countertops, you will need to shape them to fit the counter perfectly. This can involve grinding down the edges and making some alterations. You might also need to polish it in order to ensure that it looks just right. Owning a set of diamond profile wheels will allow you to accomplish this task. These wheels can grind down and polish granite without any problems at all. It will be a simple process that you can manage in a timely fashion. You simply need to install the diamond profile wheels in something like a variable speed polisher in order to make use of them. Once everything is installed, you’ll be able to get to work. You can polish the granite and make sure that it looks fantastic. If you are going to be installing granite countertops, then this is going to be an essential purchase. You need the right tools for the job, and this is going to be a necessity for certain projects. Diamond grind cup wheels are similar to the profile wheels mentioned above in many ways. The difference between them is that these are used more for smoothing out the granite and truly finishing the project. The profile wheels will be great for edging the granite and providing the shape. You can then switch to the grinding cup wheels to smooth out the surface and put on those finishing touches. 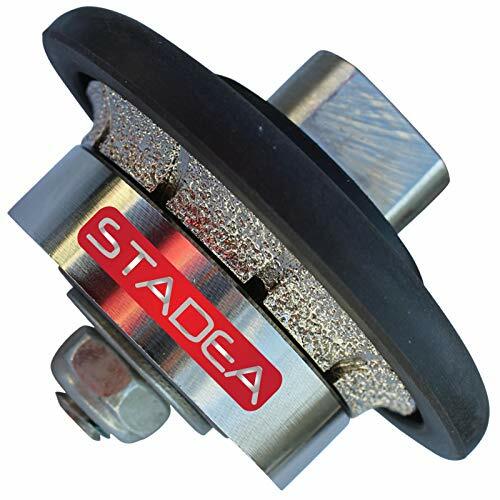 You will generally be using the same tools for these grinding cup wheels that you would be with the profile wheels. These are simple to make use of, so long as you have the right grinder and polisher available to you. You’ll simply want to know how to use your grinder to smooth things out properly before moving forward. Even if you don’t have a lot of experience with these tools, it’s actually fairly simple to figure things out. 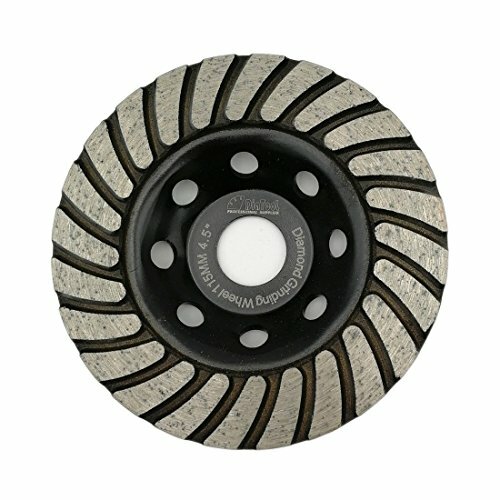 This diamond grinding cup wheel here will come in many different sizes. There are a lot of options to choose from, so finding the size that is going to suit your needs properly shouldn’t be too difficult at all. No matter what size you decide to buy, you’ll be getting a tough wheel that can handle a heavy workload. This will be a good grinding cup wheel to use for many purposes. Diamond drill bits are important for when you need to drill holes in granite. Thankfully, purchasing diamond drill bits is very simple. They aren’t too difficult to find, and they can be installed in your power drill with relative ease. You’ll be able to drill the proper types of holes that you need, so long as you have the right drill bits. As you might expect, there are many types of drill bits that come in various sizes. You’ll want to know the measurements of the holes that you need to make before making a choice. 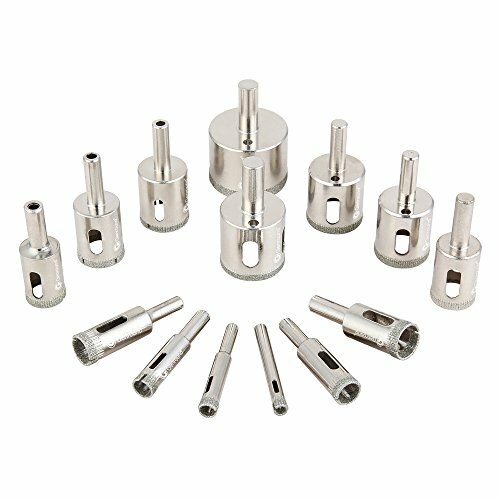 Most of the time, when you buy diamond drill bits, they will come in sets with multiple sizes. This can be convenient for getting the size that you need because you’ll have options. The diamond drill bits being shown here should work excellently for your purposes. They are high-quality and will work great for drilling through granite. You’ll be able to use these drill bits to drill through other hard surfaces as well. It’s a good purchase that will make your power drill have even more utility for you moving forward. A good table saw will pretty much always come in handy when you need to make cuts. When you are working with granite, you will simply want to ensure that you have a diamond saw blade installed in the table saw. Once it is ready, you will be able to make the precise cuts to the granite that you need to make. Using a table saw is great for making lots of cuts in a short period of time. This table saw that is being shown here is really convenient. It comes with its own stand that has four sturdy legs. People who work with granite professionally like having saws like this that they can take with them on large jobs. It is easy to set up this table saw so that you can use it on a job site. You’ll be able to make many types of cuts with this table saw. It is also going to prove useful for many purposes outside of cutting granite. You’ll be able to use this table saw for DIY projects, general construction, and much more. It’s a handy tool that you won’t regret purchasing. Tile saws will be an important tool to own when you are working with granite in your bathroom or kitchen. You can install diamond blades in a tile saw very easily. Some blades will be meant for either wet cuts or dry cuts specifically. Simply make sure that you are using the proper blade for the type of cutting that you are doing, and everything should go swimmingly. The head of this saw is also capable of pivoting to make different types of cuts. You can make bevel cuts at different angles when you own this handy tool. Being able to cut granite in so many ways is going to be very useful. You’ll be able to get your granite cutting job done in a timely fashion when you have this around. This tile saw is an industrial model that will be able to make short work of many jobs. It has an adjustable head that allows you to change up the cuts to suit different tiles. It’s a convenient feature that helps this unit to stand out among the competition. You will have to buy a diamond blade separately in order to cut granite, but this shouldn’t add too much cost to the unit overall. Remember to pay attention to what your tile saw is supposed to be used for. Some tile saws are advertised as being specifically for making wet cuts. You may not want to try to make dry cuts with these saws. You will be able to find tile saws that are capable of making both types of cuts, and these might be more useful to you for the sake of convenience. A circular saw will be one of the most useful types of handheld saws to own. People use these saws on so many different types of projects. You can use the saw to make precise cuts, and it is simple to get the saw wherever you need it to be. When one of these saws is installed with a diamond saw blade, it will be able to cut granite very smoothly. When you need to make some quick cuts to granite, it will be good to have a circular saw around. You will be able to control the depth of the cuts easily and will remain as accurate as possible. You can even make both straight cuts and bevel cuts with this unit. It’ll definitely be a worthwhile addition to your toolkit. This saw here even comes with an integrated dust blower. This is nice because it will blow the dust out of the way while you’re cutting. This can help to give you improved vision so that you can avoid any mistakes while you’re cutting the granite. With a high-grade aluminum construction, you will be able to feel confident about relying on this tool. It has also been designed to be easy to hold in your hands. This is a tool that you can potentially use for long periods of time. If you need to make a lot of cuts, then you won’t have to feel overly tired when holding this saw. It’s light enough that it is easy to use while still remaining rugged with the high-grade aluminum construction. Some people choose to use a miter saw instead of a table saw when cutting granite. These miter saws are pretty easy to move to a job site, so they can be very convenient overall. When installed with the proper diamond saw blade, you’ll be able to make precise cuts into granite surfaces. If you already own one of these, then it will be perfect for cutting tiles or other granite items. People use these saws for a lot more than just granite. In fact, it is actually used more often to cut lumber for construction or carpentry projects. People love these saws and how quick they can make the process of cutting boards. They are both durable and powerful, making them a fantastic tool to own. When you need to make a lot of precise cuts, having a miter saw can expedite the process. You will be able to make many cuts in quick succession with this tool. If you want to speed up the process, then you should definitely consider purchasing this tool. It won’t be the answer to all of your granite cutting needs, but it can be a good part of the equation. You will be making use of this variable speed polisher and grinder in order to finish up granite countertops. 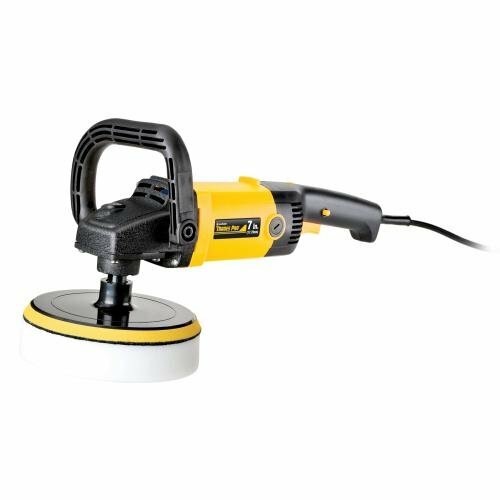 It will also be useful for polishing and grinding other items, but people most commonly use it for countertop installations. This is a powerful tool that is actually quite simple to use. You will be able to feel very natural while holding this tool, and it shouldn’t be too cumbersome. This will work well for either wet stone polishing or dry stone polishing. The fact that it is versatile in this way makes the tool that much more appealing. The variable speed settings are very useful, and you’ll be able to have a lot of control over how you approach things. The dial that adjusts the speed is simple to understand, and you’ll always feel like you know what you are doing. An ergonomically-designed handle makes holding this tool feel as comfortable as possible. It isn’t too heavy either, so you won’t feel overly fatigued even when you have been polishing granite for a long period of time. Your back and your hands will feel fine after using this tool, as it was designed for the comfort of the consumer. This is a durable tool, so you’ll be able to use it for many years. This isn’t an inexpensive tool, but it will be a valuable ally when you’re working with granite. Being able to grind out the edges of granite for certain projects is going to be important. You also want to be able to polish the surface properly. This is going to be one of the best tools for the job, so buy it if you don’t already own a high-quality polisher and grinder. Owning an angle grinder will also come in handy when you are working with granite. People use angle grinders in order to grind down the edges of granite. This is good for when you’re installing countertops, sinks, and other types of granite products. As long as you have a diamond grinding wheel installed in your angle grinder, you’ll be able to do good work. The angle grinder being shown here is a truly useful tool. It comes with a diamond blade and grinding wheels. This makes it useful for the purpose of working with granite right off the bat. Most of the tools on this list have required a purchase of a diamond blade in order to be used with granite, making this angle grinder somewhat exceptional. It only weighs four and a half pounds, and it is really simple to hold. You can grind the edges of your granite without feeling too tired. Despite the lightweight design, this is a durable tool, too. You’ll be able to use your new angle grinder to help you cut and grind granite for many years to come. There are also going to be times when you will need to drill into granite. As long as you have the proper diamond drill bits that are mentioned above, you’ll be able to make use of a normal power drill to do this job. It’s going to be capable of drilling holes in granite so that you can complete your task. This will always be easy when you have a power drill that is simple to operate. The power drill being shown here is one of the most reliable units on the market. It is simple to use while maintaining excellent power. This will be able to make short work of most of your granite drilling needs. It is a drill that feels good to use and will come in handy for many purposes outside of granite projects. This is a cordless drill that will be simple to use in many positions. You won’t have to worry about it running out of power during long jobs either, as the battery life is very respectable. When you combine this with the soft-grip handle, you can see how this power drill is so sought-after. It is a very good power drill that will be a constant companion on many of your jobs if you make the decision to buy it. This isn’t a cutting tool, but it will be a good idea to purchase a dust mask to wear during your job. You don’t want to breathe in the dust that you are kicking up while cutting into the granite. This could definitely cause you some problems, and you don’t want anything to sidetrack you. Buying a simple and affordable dust mask can prevent you from having problems, so purchase one before starting out just to be safe.